Pairing world class anti-aging ingredients with groundbreaking innovation, Rodial is a global luxury brand founded by former beauty editor, Maria Hatzistefanis in 1999 when she identified a gap in the market for high performance, targeted skincare that would address specific skin concerns. The brand has enjoyed worldwide success with botanical formulations geared towards instant results and long lasting benefits. Rodial has created it's own niche in the beauty industry by creating unique formulas with unusual names that you wouldn't ordinarily find in beauty like Snake, Bee Venom and Dragon's Blood which make up some of their most popular ranges. 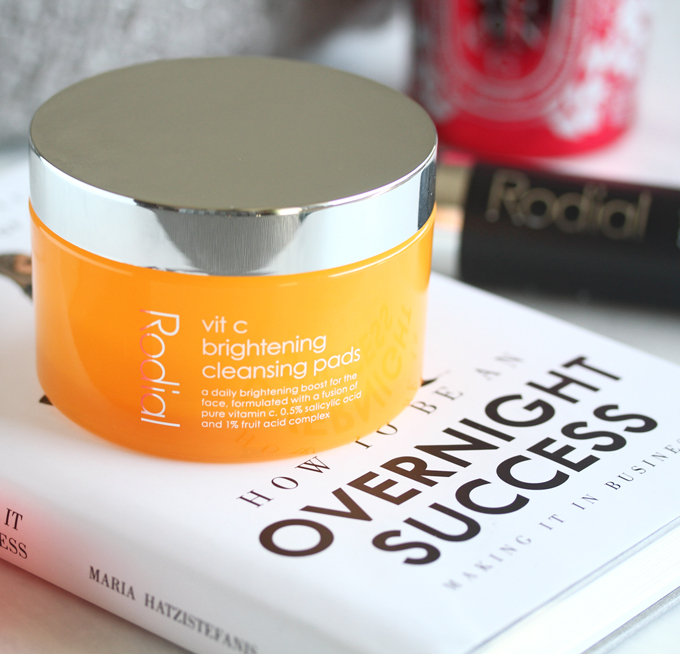 Infused with a complex of pure Vitamin C, 0.5% salicylic acid and 1% fruit acid, Rodial Vitamin C Brightening Pads work to gently deep clean, exfoliate and retexture skin for a radiant and more even complexion. The single application pads can be used morning and night for best results. These easy to use pads are well soaked in solution with a light citrus scent. I like to use them in place of toner especially following my Clear + Brilliant treatments for that extra boost of skin brightening vitamin C while the acid complex helps to facilitate the sloughing process. They work as they claim and deliver visible results quickly, leaving my skin feeling refreshed and looking clearer and brighter without any dryness, sensitivity or irritation. I noticed such a difference after I stopped using them that I purchased a second jar. 1% fruit AHAs work to exfoliate and hydrate the skin. 0.5% salicylic acid helps to refine pores and reduce blemishes. Glycolic and lactic acids contribute to a rejuvenated appearance. Vitamin C brightens skin while leaving it looking more even. Aqua (Water), Propylene Glycol, Bis-PEG-18 Methyl Ether Dimethyl Silane, ,Sodium Lactate, Glycolic Acid, Citrus Sinensis (Orange) Fruit Extract, Lactic Acid, Phenoxyethanol, Ethyl Ascorbic Acid , Salicylic Acid, Disodium EDTA, Ethylhexylglycerin, Alcohol Denat., Ananas Sativus (Pineapple) Fruit Extract, Passiflora Quadrangularis Fruit Extract, Vitis Vinifera (Grape) Fruit Extract, Sodium Sulfite, Punica Granatum (Pomegranate) Extract, Parfum (Fragrance), Citral, Limonene. 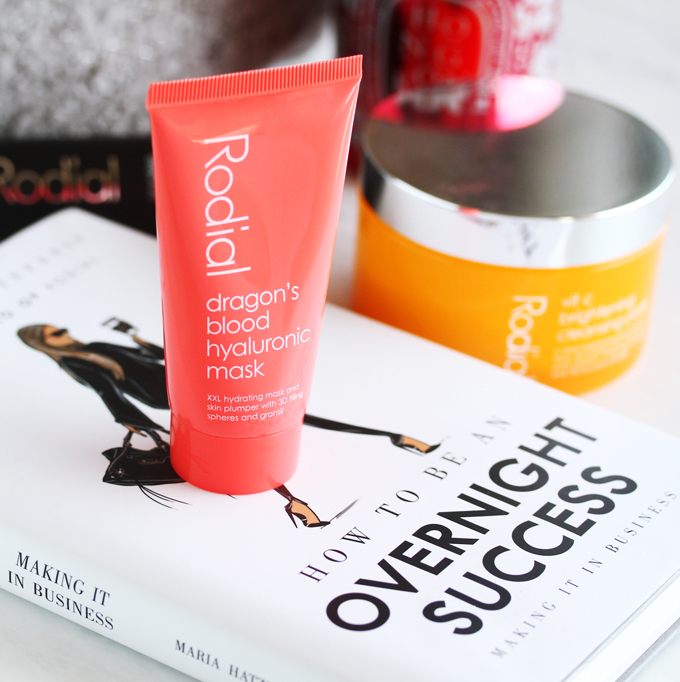 Rodial Dragon's Blood Hyaluronic Mask is an innovative mask with a synergistic ingredient blend that replenishes skin with intense hydration while gransil plumps the appearance of fine lines for the appearance of a firmer and more smoothed out complexion. The dragon’s blood is sangre de drago sap produced by South American croton lechleri trees has long been used by indigenous tribes to heal wounds. This sap also contains polyphenols which are known for their anti-oxidant properties. This product can be used as overnight sleeping mask or as as a leave-on mask during the day for an infusion of moisture. It is a cooling gel with a lightweight texture which feels soothing upon application. I've tried using it at night and also during the day and I actually prefer it for day use because of the way it transforms my face, imparting it with a dewy, plumped and more even toned appearance. While it's lovely, this mask is not something that I use daily but more when my skin needs a boost or before an event. I usually apply it following my sunscreen. It works well in combination with other products and under makeup. Dragon's Blood reduces redness and inflammation. Hydromanil extracts from the tara tree that firm and refines skin texture while improving dry, dehydrated skin. Gransil corrects skin tone and smoothes the appearance of fine lines and wrinkles. LaraCare extracted from the Larch tree stimulates a mild exfoliation on the skin. Hyaluronic acid replenishes the outer layer of skin which helping it to retain moisture. Aqua (Water), Glycerin, Cyclopentasiloxane, Polysilicone-11, Propylene Glycol, Dimethicone, Pentaerythrityl Tetraethylhexanoate, Phenoxyethanol, Hydroxyethyl Acrylate/Sodium Acryloyldimethyl Taurate Copolymer, Acrylates/C10-30 Alkyl Acrylate Crosspolymer, Triethanolamine, Squalane, Sucrose Palmitate, Galactoarabinan, Glyceryl Linoleate, Tocopheryl Acetate, Disodium EDTA, Ethylhexylglycerin, Polysorbate 60, Parfum (Fragrance), Limonene, Potassium Sorbate, Sodium Hyaluronate, Sorbitan Isostearate, Geraniol, Linalool, Croton Lechleri Resin Extract. Rodial Snake Serum O2 gets it's name from the Syn®-Ake dipeptide, a unique snake venom inspired peptide inspired Temple Viper Snake Venom powering the revitalizing formula that smoothes the look of skin and reduces the visual appearance of wrinkles while a fast-action oxygen carrier works to restore a healthy, youthful radiance. Antioxidants provide a shield to protect skin from pollution and free radicals. This serum has a nice, silky consistency with a light, fresh scent. It absorbs into the skin easily and quickly. While it is pleasant to use, I can't say I noticed much in the way of a smoothing effect in either the short or long term and I have finished the bottle. I also don't really have any expression lines that need to be addressed since I tend to refrain from making over exaggerated facial expressions. I received this product as a gift and I would not repurchase it. Syn®-Ake dipeptide a wrinkle freezing ingredient that mimics the effects of temple viper snake venom that smooths skin while reducing the appearance of fine lines and wrinkles. Filflow BTX gradually carries oxygen into the skin to improve product penetration deep into the different layers, encouraging cell respiration to improve tone and texture. Sodium hyaluronate moisturizes and plumps the skin while increasing moisture retention. Gransil is built-in skin primer that blurs fine lines and imperfections. "You are not born an entrepreneur. It's a skill that you learn along the way." 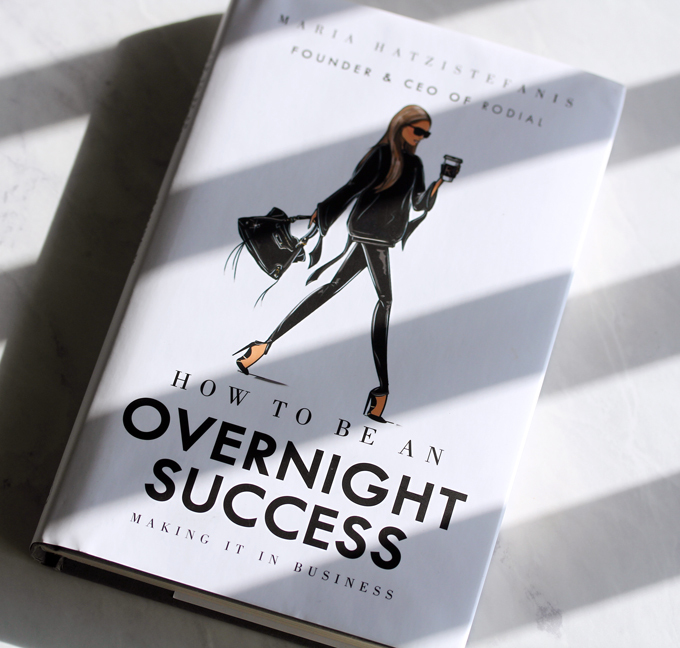 Written by Rodial Beauty and Nip+Fab founder/CEO Maria Hatzistefanis, this book details her journey in creating the beauty brand and making it a global success. She stresses that while Rodial appeared to be an overnight success, it was an illusion. Her business was built on years of hard work, tireless efforts, overcoming challenges, lessons learned along the way and a ton of resilience. The way her story is presented in the book is accessible and relatable and Maria is refreshingly honest with her sensible and practical advice. An element that really stood out to me was when she talked about how brands stray from their core values once they become big and Maria realistically details of how she managed to stay true to herself from the beginning to the present while growing her brand. This is an enlightening and inspirational read whether you're an entrepreneur or not because her advice is applicable to many career situations. I was fortunate to meet Maria on two occasions including a fascinating talk with hosted by Alexa Chung which I attended with my friend Allie last year. She is friendly, down to earth and a lovely person. I'm not just saying that because she complimented my skin. We did have a nice conversation and she also believes that using the right cleanser for your skin type is an integral step of any skincare routine. I was lucky to get my book signed and I have an extra copy to give away to a lucky reader. This is an international giveaway and you can enter below or through this link. Good luck! I've been mostly impressed with the Rodial products I've used and I would like to try more of their products in the future. I'm a big fan of their Diamond Liquid Concealer which is magic for undereye dark circles and the Rodial Pink Diamond Lifting Face Mask is such a luxurious skin treat. 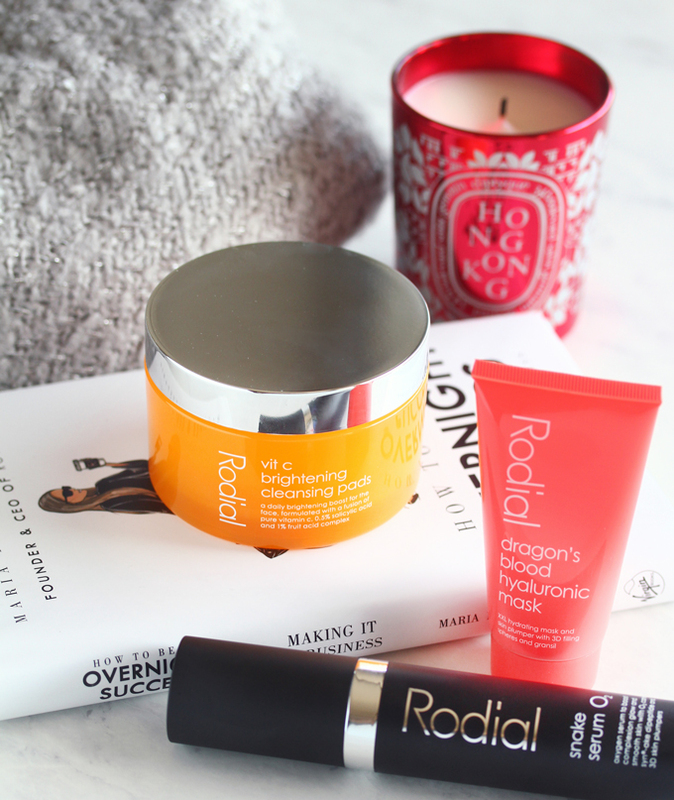 Rodial products are available at Space NK, Nordstrom, Bloomingdales, Amazon, Ulta Beauty and Dermstore. 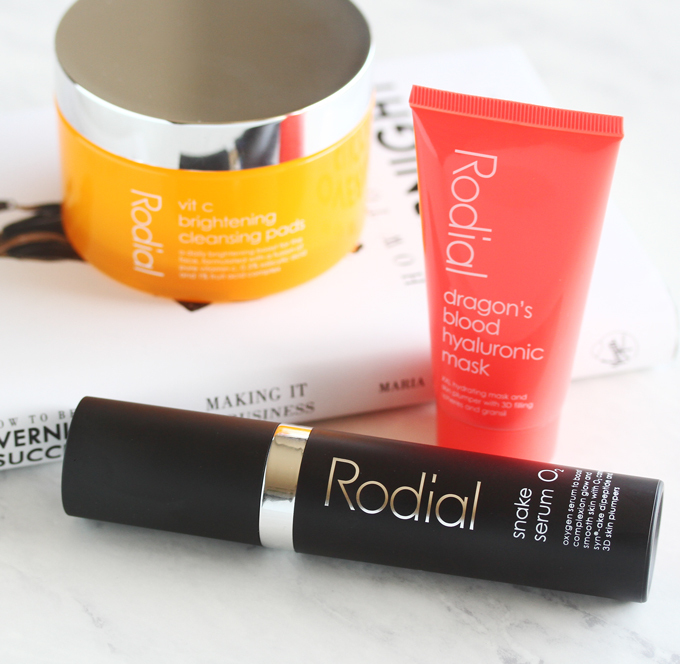 Have you tried any of these Rodial products? 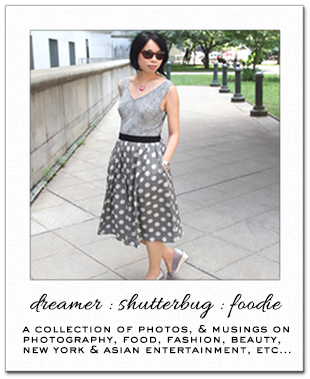 Disclosure: This post includes products purchased by me as well as those which have been received for editorial consideration (denoted with a *) and there may be affiliate or referral links. For more details about my product review policy, copyright, and information about affiliate links, please refer to the Policies page of this blog. I've got to check out this book! The serum and pads would be something I would want to try. I have heard a lot about Rodial products and would love to try them at one point. I am surprised though to see that the Vitamin C pads contain actually less than 1% Vitamin C, I thought it would be more. I am thinking to try this brand for a long time, though the products are quite expensive but if they are really effective one can invest one's money. Rodial Snake serum sounds great. I would like to test this serum for me. Thanks for your honest review. Ah yes I attend this event with you, it was great is the serum. I loved it. I bet the rest of the line is just as good. Love your review here. And I can see why this brand is so successful. My favourite current beauty product is an Essence red lipstick, I wear it almost every day. Rodial sounds like a great brand. That mask sounds lovely. I love how the founder is keen on keeping the original brand values. I'm sure her book is a fascinating read. Great giveaway! I love my Marc Jacobs Remarcable! I love a rose lip salve. These products look gorgeous! I love reading books about entrepreneurs and how they got their company started, so I'll have to give this a read. I'm really working on trying to even out my complexion and I love a good mask and serum so count me in! My fave product right now is a Vine Vera serum because serums are my new obsession. I've never tried this brand, but it sounds wonderful! I would love to try the mask...I like that it can be used during the day as a leave-in! Thanks for sharing! My current fave that really got me through winter is the Aritaum Ginger Sugar Overnight LipMask. Love it. Miles ahead of its competitors. I like Elizabeth Arden lipstick because I love their color and consistence. Love this Rowena! Currently loving Mizones hyaluronic acid, which is becoming near to impossible to buy as stores keep discontinuing it. I'm really loving the Stila makeup products!